1. 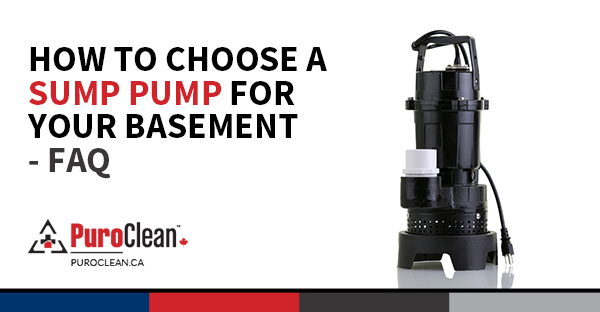 What types of sump pumps are there and what are their Pros and Cons? There are two primary types of sump pumps: Submersible and Column (Pedestal). Submersible sump pumps require a larger sump pit and, because they are below water, the motor will be cooled off faster and the noise level is reduced when the pump is operating. Pedestal sump pumps are useful when the sump pit is narrow or shallow. They typically last longer because the motor is mounted above the sump. In addition, they consume less power. The only trade-off is that they pump less water during a flood. 2. What type of float switch is required? There have three main options: tethered, vertical and electronic float switches. A tethered switch is good for deeper sump pits with a large diameter. This switch extends the period of time between pump cycles, allowing the motor to cool off more efficiently. Vertical switches are better for narrow and shallow sump pits and will kick off the pump more often. Electronic switches are more compact and require a small sump pit. However, an electronic switch should not be used if the pump receives water from a wash sink or laundry machine to prevent soap scum from making contact with the switch. 3. How much horsepower should a sump pump have? More horsepower means that the water is pumped faster, but it also means more power consumption. If a home has frequent water problems and the sump pit fills rapidly, choose a sump pump with more horsepower. Also, the size of the sump pit should be increased to prevent the pump from running too frequently. 4. What material should a sump pump be made of: cast iron or thermoplastic? Cast iron sump pumps are generally stronger than thermoplastic, but both are designed for long life. Besides the stronger material, the advantage of cast iron pumps is that they distribute heat from the motor better, maximizing the cooling ability of the sump pump. Plastic sump pumps, on the other hand, are less expensive. 5. Are check valves necessary? A check valve is a good addition to a sump pump system. It prevents water in the discharge pipe to fall back into the sump pit, which would be re-pumped if it weren’t for the check valve. It is a good idea to purchase a check valve to save on electricity and prolong the life of the sump pump. 6. Are battery-operated backup pumps necessary? In addition to the main sump pump, a backup pump that uses batteries can be installed for extra protection. These devices make sure water is pumped out during a power outage or when the main pump malfunctions. Those who live in a flood prone area should consider installing a backup pump – they improve the flooding protection in the basement or crawl space. In order to ensure a sump pump works properly throughout the year, it should be tested and maintained periodically. The PuroClean team stands ready to provide professional restoration services to any property affected by fire, water or mould damage. Follow us on Twitter, Facebook, Google+ and LinkedIn to get our notifications! PuroClean is a leading commercial and residential restoration franchising company. Founded in 2001, the company offers fire and water cleanup and restoration services, mould mitigation and remediation, and biohazard cleanup and removal throughout the United States and Canada through its franchise network of 240 offices. Learn more.